There is a reason why long winning streaks are rare in soccer – stuff can easily go wrong! This was evident against Costa Rica. Michael Bradley is without a doubt the most important Yank and his injury before the game clearly unsettled the team. While the US should have expected an early onslaught, they looked totally shocked and were in some ways fortunate not to give up a third goal. All looked lost. Yet… and there is a very big YET… the US fought there way back into the game. By the second half the US looked likely to level. Dempsey hit the post and Donovan was terrorizing Costa Rica. 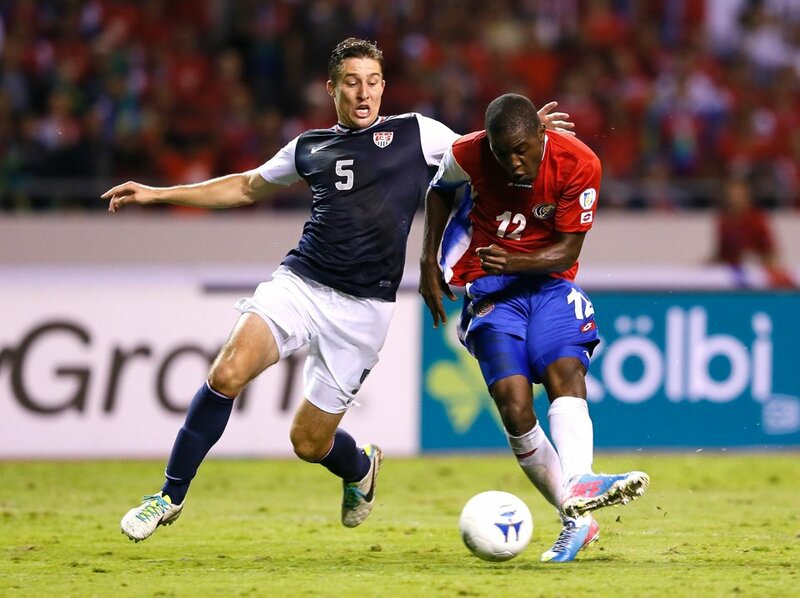 Unfortunately, Costa Rica hit on the break effectively ending the game. It is tough to be too critical of Klinsmann, especially after such a great run of games. But last night we saw some of Klinsmann’s managerial tendencies back fire, namely his continuing willingness to play players out of position. First, Fiscal was totally lost at right back. The second goal was caused by him allowing CR to get behind him, forcing Gonzalez to come over. Even then Fiscal didn’t provide any help. As a result Gonzalez was isolated and could do little to prevent the cross into the box – a cross he would have cleared on the other end if he hadn’t had to cover for Fiscal. That wasn’t the only time Fiscal was beat on the wing. Furthermore, Fiscal offered nothing going forward. It is one thing if Fiscal was the emergency option. But Klinsmann had him there over Cameron who plays there for a Premier League side. Granted Cameron doesn’t get forward very much with Stoke, but if he is your back up DM, then he is clearly better on the ball than Fiscal. The lack of true fullbacks is clearly the major hole in the US side. Second, the substitutions hurt, rather than helped. I thought Klinsmann decision to bring on Eddie Johnson was a good one. A true CF would through something new at a CR backline that was on its heels. But by taking off Zusi he forced Donovan – who at that point was terrorizing the CR back line out wide. All of sudden the US attack began to sputter without Donovan. A better move would have been to bring on EJ for Fiscal and shift Fabian Johnson to RB with the direction to get forward. Donovan would have then have had defensive responsibilities on the left, but wouldn’t have needed to stay wide as Beasley could have provided the width. Instead, with Fiscal offering little going forward and exposed defensively, Donovan had to stay wide and play more as a true RM. Furthermore, it made little sense to bring on Johnson if you wanted to bring on Altidore a few minutes later. Bringing on Altidore and taking off Fabian Johnson may seem like an attacking move, but in reality it was anything but. The problem wasn’t Jozy. It is that by bringing on Jozy required Eddie to play deeper and wide (once again a player not playing his normal position). With Donovan isolated wide, and Eddie Johnson having to link the play the US became completely disjointed. While the third goal was clearly demoralizing, the U.S. barely strung passes together once the subs were made. Also a note on Howard. From my view the third goal was on him. He got his positioning entirely wrong. First, at the time the ball was booted forward, Howard was very deep, essentially at his penalty spot. He should have been further forward prepared to come out and clear balls over the top. Second, his first reaction was to go backward toward his goal once the ball is kicked. If he decides to go for the ball he gets there. Even if it is close he forces Campbell to round him allowing the CB to recover. He had to see that Besler had no chance of catching Campbell. Third, even if he didn’t want to leave the box, he still needs to charge at Campbell to shut down the angle. He literally just stood there – just outside his six yard box – and was beaten low. He has to attack the ball there. Now some of this might be on the coaching staff, as Howard might have been told to stay back and not to venture out as a sweeper keeper. If so that’s a mistake, especially when chasing the game. Overall, the game probably couldn’t have gone much worse. The injury to Bradley and the yellow cards (especially the boneheaded one by Altidore) will really test the depth of the US. That being said, the US is still in very good shape for qualification and if Dempsey’s shot hits the inside, rather than the outside, of the post, we are talking about the tremendous resilience of this US side. This game highlighted some areas for the US to improve, what it didn’t do is cause reason for panic.